A forty-acre retreat nestled among the hills Tennessee's Highland Rim, Evins Mill offers the amenities of a resort in the setting of a Bed & Breakfast. Originally the estate of U.S. Congressman Evins, it is today a country inn, offering an ideal setting for bed & breakfast weekends, weddings, and meetings. Its natural beauty is breathtaking. 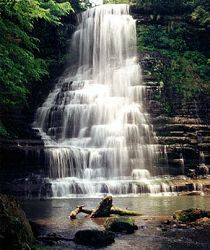 Designated a "State Natural Area," our property features Tennessee's tenth highest waterfall, swimming holes, hiking trails, and a fishing pond. Nearby is River Watch Golf Course and Center Hill Lake. Every July 4th is the Fiddler's Jamboree, the country's largest bluegrass music festival. All 13 award-winning and romantic bluff view rooms have private baths. Our lodge, with poplar floors and fieldstone fireplaces, houses The Millstone Restaurant. 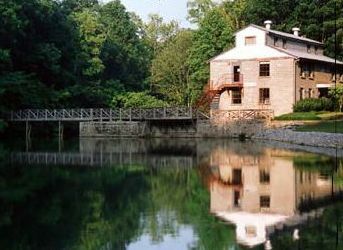 Our gristmill is open to corn grinding demonstrations and houses a spacious renovated room for weddings and conferences. 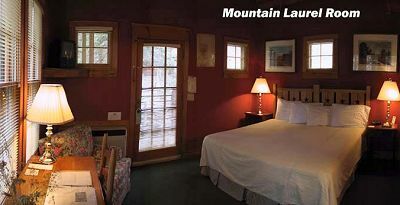 Bed and Breakfast Package: American Plan including dinner and breakfast.$190 to $235 for one night/two people. This and other TennesseeBed and Breakfast Inns can be found here in The Register.